The celestial angels come in all hosts of choirs. Some are designed to watch over the fundament, ensuring that the laws of physics continue to operate as has been decreed. It seems like their job should be pretty easy, simply maintaining the status quo, but with Mankind always working to discover and ultimately tackle the natural laws, you’d be surprised how often those winged workers have to keep things in line. Our favorite of the angelic hosts are, of course, the guardian angels. These few are tasked to watch over particular groups of people or important social events just to make sure that the almost unavoidable accidents can at least partly circumvented. You know… those moments where you’re sure that you were just about dead, like when you nearly broke the porcelain knickknack your mother-in-law gave you but managed to catch the thing with the cuff of your shoe? Yep, that’s Guardian Angel territory for sure! 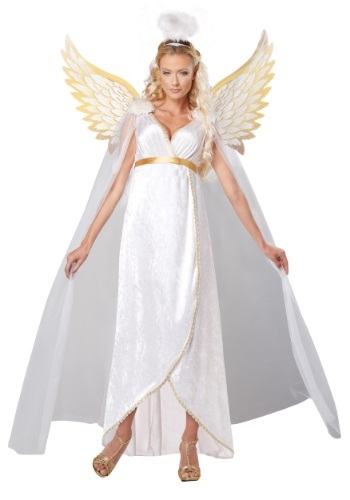 Well, now you can dress like those angels with this Adult Guardian Angel costume. This sleeveless, crushed velvet and knit mesh fabric dress has the look of a wrap and shimmers with almost glittery appeal, edged with gold braid all along the neck and hemline. A cloak drape of white knit mesh glides down to give you an ephemeral glow, though it is your gold feather printed wings and a halo of gossamer feathers that clearly designates you as the angelic guardian of your family and friends. Now if you only you could get in touch with the fundament folks to help you actually take flight!